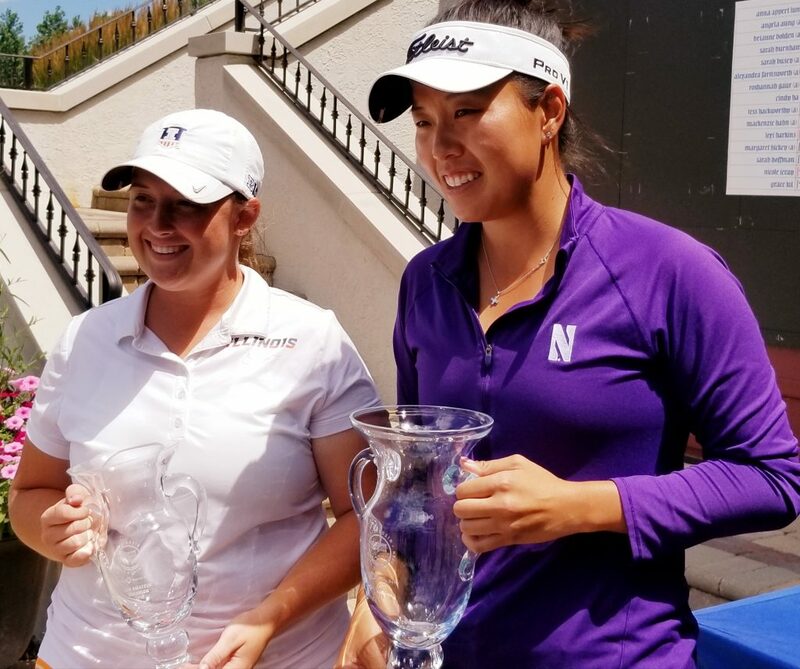 Hannah Kim (right) won her first pro title and Tristyn Nowlin was runner-up and low amateur. Two years ago Hannah Kim tied for third in the Phil Kosin Illinois Women’s Open. Last year she was the runner-up. So, guess what the former Northwestern standout did to climax the 24th playing of the IWO on Wednesday at Mistwood, in Romeoville? Kim, the stalwart of coach Emily Fletcher’s powerhouse Wildcat teams of the past four years, did some major re-writing of the tournament record books while notching her first professional victory. That formula worked to perfection this week. Kim posted rounds of 68, 65 and 67 for a 16-under-par 200 total for the 54 holes. She tied the tournament record for low 18-hole score with her second-round birdie blitz. That gave her a six-stroke lead entering Wednesday’s final round as well as the tournament record for low score through 36 holes (133). Her final score was a whopping seven strokes better than the previous mark held by a pair of amateur winners, Annika Welander in 2005 and Stephanie Miller in 2016. Hannah Kim was a winner in only her third pro tournament. 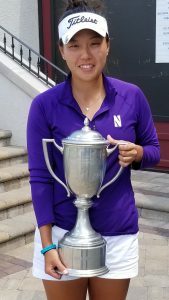 Kim’s previous two appearances in the IWO were as an amateur, since she still had collegiate eligibility at Northwestern. She admitted to missing her college team. “It’s hard with nothing getting paid for now,’’ she said, but that won’t be much of a problem if Kim keeps on winning pro tournaments. She is 26-under-par on her nine IWO tournament rounds over the last three years with this year’s showing the most impressive. “My target score was double digits under par, and I did it,’’ said Kim, who earned $5,000 for the victory in her third professional tournament. A resident of Santa Ana, Calif., she had previously competed in the Ohio Open and California State Open. Next up is the Tennessee Open. “I’m just trying to play a bunch of tournaments to keep myself sharp. I want to make it through (LPGA) Tour School and get my card,’’ said Kim. That competition starts in the fall. Kim’s most serious challenger for the title on Wednesday was amateur Tristyn Nowlin. A University of Illinois junior from Richmond, Ky., Nowlin got within five strokes of Kim when she rolled in a birdie putt from the fringe of the No. 10 green. She gave the shot back on the next hole when she hit her second shot into a hazard left of the green, struggled to make bogey and never threatened again. Like Kim, Nowlin is a big fan of Mistwood’s course. Last month she went all the way to the final of the Women’s Western Amateur on the same layout and that showing, in one of the nation’s most prestigious tournaments, led to her return this week. That wasn’t enough playing head-to-head with Kim in the final round. Kim maintained her six-shot lead through the first nine holes and kept her concentration through the back nine, especially on its two par-3 holes. She made a nine-footer to save par at No. 14 and made birdie at the 133-yard 17th. Nowlin had a four-shot cushion on third place Sarah Burnham, a former Michigan State player, and Burnham was two ahead of two-time IWO winner Nicole Jeray, a veteran of the pro tours from Berwyn. Jeray, for the third time, was thwarted in her attempt to get an IWO title in three decades. She lost twice in playoffs since 2010. Jeray has played on all three women’s tours – the Symetra, LPGA and Legends – the last few years and will again this year, though she is changing her golfing focus. She is now teaching and coaching at both Flagg Creek, in Countryside, and Cog Hill, in Lemont.